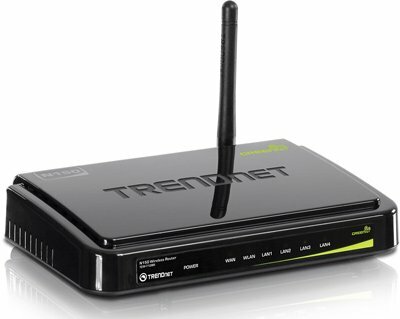 TRENDnet presents the TEW-712BR, a new 150Mbps wireless router that focuses on the "performance-oriented entry level market". The MSRP is $44.99. -TRENDnet, a best-in-class wired and wireless networking hardware brand, today announces the availability of the N150 Wireless Router, model TEW-712BR, a performance oriented entry level router with the power to easily stream HD video to your television while surfing the internet. The TEW-712BR is designed for moderate Internet users who live in an average sized home. Connect computers, NAS drives, and printers to the four Ethernet ports on the back of the router. The router supports 150 Megabit per second (Mbps) theoretical wireless speeds-the same speed as embedded wireless cards in most tablets, laptops, and smart phones. The latest encryption protocols protect your valuable wireless network. An intuitive guided router setup takes the work out of creating a wireless network. A convenient on/off button on the back of the router safeguards router components. LED displays on the front convey wired and wireless status. Connecting computers to the router is even easier using Wi-Fi Protected Setup (WPS). Gone are the days of entering complicated encryption codes. Simply press the WPS button on the TEW-712BR, and then press the WPS button on a compatible wireless adapter. Confirm you would like to connect and the devices automatically exchange information and connect. Users are empowered with the ability to manage connected devices, websites access, and access to file types. Parents can create a list of smart phones, tablets, printers, and laptops which are allowed to wirelessly connect to the router-thereby greatly reducing the ability of unwanted users to gain access wirelessly. Additionally, specific websites and files types, such as video files, can be blocked. Real-time router logs record wireless connected devices, packet loss performance, system activity, and internet attacks. Access the router to review logs or have the router email weekly or daily logs. TRENDnet is excited to support the open source community with this router. Linux developers and open-source enthusiasts can access open source code for this router at openwrt.org. TRENDnet's GREENnet energy saving technology increases wireless routing efficiency for all phases of wireless connectivity-resulting in energy savings of up to fifty percent.